There are three 3-day Yom Tovs this month. And yes, there were three 3-day Yom Tov’s two years ago. Did I mention it’s the same schedule next year too? Don’t get me wrong, I’m not complaining about Yom Tov, a time of simcha. Just sayin’ it’s a challenge to cook and eat all those meals. While nothing’s foolproof, we’ve come up with a few rules for Shabbos that help our family. They apply to Yom Tov as well. 1. Serve dinner from the kitchen: We rarely have more than one or two guests for dinner, making this an easy rule. Dinner consists of soup, a stir fry (often vegetarian) and a roasted vegetable dish. Keeping the food in the kitchen means we’re less likely to take too much or go back for seconds. 2. Go light on the meat: I’m not sure why eating meat is considered cool in the frum community. No doubt people like it, but why are there entire Shabbatonim and shiurim based around it? Certainly, it’s not doing any of us any good. We manage to make less meat go a long way. 3. One cookie and one piece of candy from shul: Especially when there’s a bar mitzvah, shul can be a junk food fest. This rule keeps my kids sane, while keeping them hungry for lunch. If they somehow manage to squirrel away an extra candy, we save it for the third meal. 4. Eat a light lunch: Our lunches are almost entirely salad. We start with a cold soup or fish and then eat dishes like: udon noodle salad (recipe to come later this week), thai cabbage slaw, salsa and chips, big ol’ green salad, wheat berry salad, summer bean salad (see below) and vegan pizza. On Yom Tov, we usually start with soup. 5. Make a healthy dessert: A dessert like banana cocoa ice cream or date balls (see below) keeps me away from the brownies, cakes and cookies. 5. 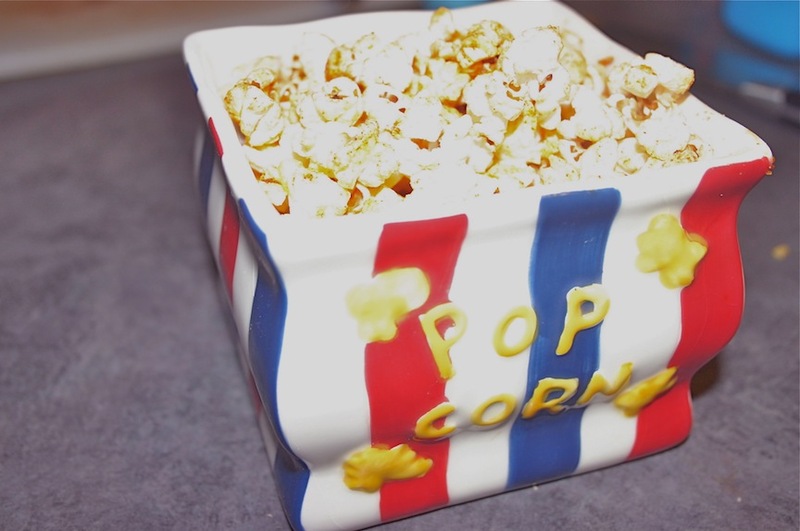 Snack on popcorn: Shabbos parties, featuring a whole plate or bag of treats, are gross. My kids used to beg for it, but enough “no’s” means they’ve gotten used to not having it and don’t even ask. They love popcorn in the afternoons, especially when we flavor it the way our dear neighbor suggested (See a version of Shevy’s recipe below, and while you’re at it, Like her page on Facebook to view her talents beyond healthy cooking.). 6. Work out after Yom Tov: After three days of Rosh Hashanah and Shabbos this year, there’s no chance of working out on Tzom Gedaliah the following day. When I realized this, I cried. Really. Good news for all of us is that Frumba Chicago is celebrating their 2-year anniversary Saturday night, 9:30 at Arie Crown. For only $5, you’ll have a blast and feel much better after sitting around and eating for three days. Go there especially if you have never been to zumba. And no, you don’t actually need to know how to dance. And no, no one cares what you look like dancing. L’Shanah tovah to all of you! May it be a sweet and healthy(!) year. Puree the dates in a food processor until smooth. Add the cocoa, peanut butter and honey and blend. 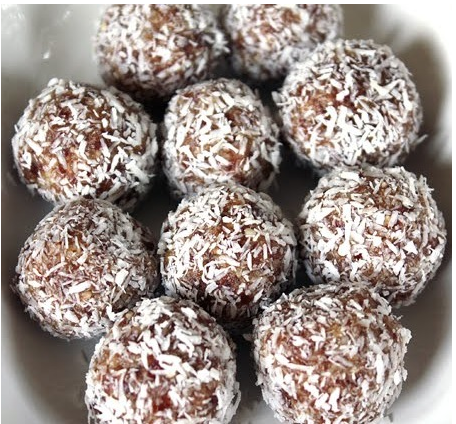 Roll into small balls and then roll them in the coconut. Store in the fridge. Combine all the ingredients and serve at room temperature. Tastes like junk food without the junk. Pop the popcorn and leave it in the pot. While it’s popping, combine the spices and oil in a separate bowl. Pour over popcorn while still hot and stir until coated.